Come to Cinnamon Indian Cuisine! We serve the best Indian dishes in Leigh that'll keep you coming back for more. We offer a takeaway service that ensures your rice, naans, and curries arrive piping hot and fully of delicious flavours. call us on 01942602000, or pop in to our restaurant today! Whether you like your Indian dishes spicy or mild, we've got all the dishes for you. 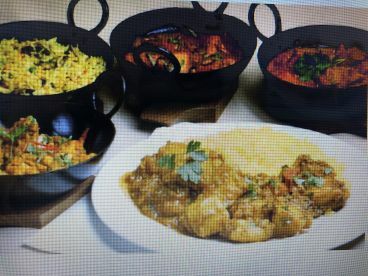 From jalfrezi to korma, and madras to dupiaza, you have so many choices. 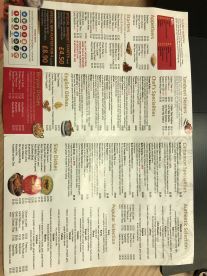 You can choose your meats too, we do chicken, lamb, beef, prawn, fish, and also vegetarian dishes. Why not complement your curry with a delicious naan or perhaps a paratha, or maybe even a side of pilao rice and bombay aloo. 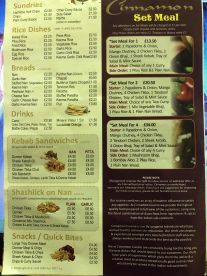 Call now or pop-in to grab a menu. Let us feed your imagination and delight your taste buds with our individually designed menus tailored to your special occasion. 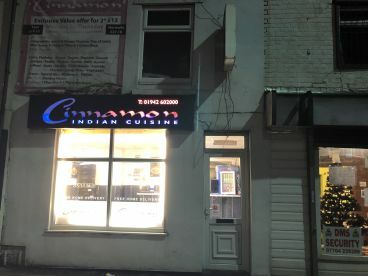 Cinnamon Indian Cuisine has all Indian spices covered. Our experience and professionalism mean that we can take the heat and we won’t let you down. For more information or to discuss menu options, contact us today. 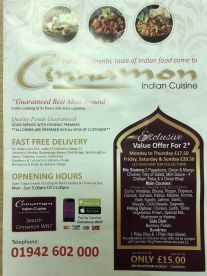 Please note that Cinnamon Indian Cuisine may not be able to honour booking requests made.